Here you will see the visual progression of a pyrographic picture. Often I'm very experimental in my work and will usually have one such piece being worked concurrently with other more standard pieces. It is not intended to give you written details of this process, but more so to allow you to see the visual stages of these experiments. I'm doing this for 2 reasons. The first being that I don't usually take written notes about each piece I do. (I do however make extensive technique notes and use thumbnail sketches.) I prefer instead to 'tumble' a project mentally before starting. This process is often so detailed that I can very clearly see the finished piece and each step it will take to get there. (It's like I have mentally burnt each piece several times before actually doing it.) The second reason for not giving you detailed notes? Well....you want me to keep some secrets don't you? :) Now...hang on for the ride. I don't know what's coming either, so this should be interesting. 1) I thought it about time to get cracking on another Aussie piece. 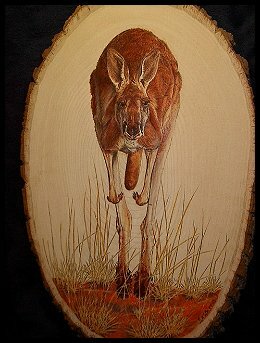 It is true that many of the animals of the African and American continents are more dynamic in muscle tone than most of the 'fluffy/cute' Australian marsupials, but there are few more majestic sights in the animal kingdom than a full grown 7 foot Red Kangaroo in full flight.I call this 'Bound'. 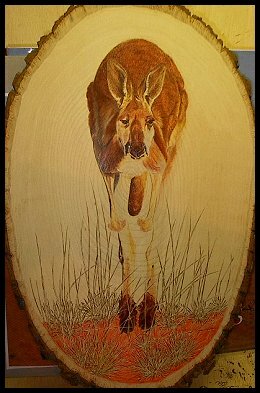 2)I have started in the previous stage by sketching in the Roo and then burning in the arid grass under and around...arranging it as though in a desert.Next, I have begun to colour the undercoat and ground in preparation of top burning to portray the tone and texture of the coat. For this I have used coloured pencils...ocre, burnt umber, grey and orange.In this stage I have also begun to start burning the body, the tail, his feet and his shnoz. 3) I continue to add tone and burn all over to keep everything in balance. 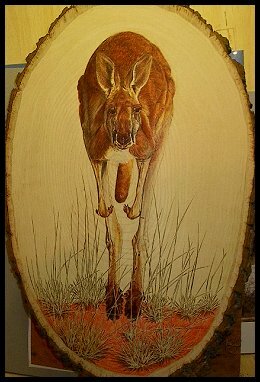 I'm starting to work on his legs now....and have begun to further colour, then burn parts of the face.In pyrography it is difficult to get absolute black or the same tones as pure pigments, so I generally lay in a very dark section early in the piece to establish a tonal balance. (His nose and eyes in this case. )I will never use black pigment in my work to gain depth, so it is pointless having my lights too dark if I can't get the deepest tone dark enough to balance with that. 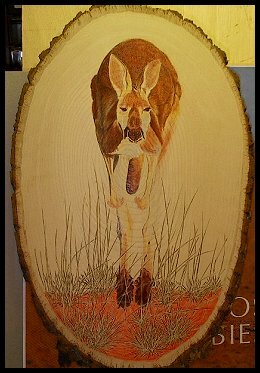 As burners know, it's not easy to take away in pyrography... much easier to add. 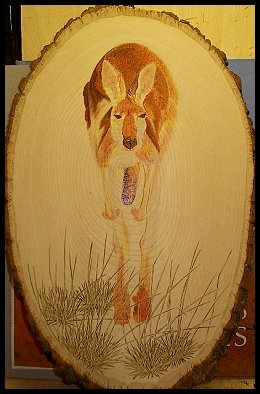 4) Why don't I use black pigments in pyrography? Well...I feel in my work black paint or ink stand out so artificially in contrast to pure burning, that the piece no longer looks 'married'....it's balance is thrown. Should this be a rule of pyrography? Sue's Rule #1 in art....there are NO rules:) Play, play, play....you'll discover wonderful things.Now...you will see I have really started piling on the tone all over. His legs are building muscle, his little arms are building, with the dark of the paws starting to create a nice contrast against the grey of the legs. His face has been 'fleshed' out with colour and tone and now it and the body coat are being worked on in tighter detail. I want the coat to reflect the texture of it's natural state. The ground is also being burnt to create shade and contours.